Happy people are generally happy, no matter what. Unhappy people are generally unhappy no matter what. Whether genetics or childhood environment, it seems to be pretty set by the time you hit your mid-20s. It’s like we have a thermostat that gets set to a particular number. You might have something that changes the temperature suddenly, but the system will try to get it back to that setpoint. Hotter or colder, the house returns to the setpoint on the thermostat. Something similar seems to happen to us about our happiness. Well, not happiness so much as our satisfaction with life. That’s a richer description than simple happiness. It’s all the things that make our lives feel rich. We may have something great happen to us (win the lottery) or perhaps something terrible (death of a child) but after time we have a tendency to return to our previous level of life satisfaction. You’ve seen this: an unhappy friend who has some great thing happen and a few days later seems down again. Or a happy friend who suffers a setback, only to go back to being happy awhile later. It’s like we have an internal set point for happiness and no matter what we just oscillate around it. Except when you get unemployed. Researchers were able to track life satisfaction among German workers, before and after unemployment. What they found was that long-term unemployment lowered the life satisfaction setpoint for these workers. Not surprising: unemployment is a major bummer. What was surprising is that after they got jobs again they didn’t bounce back to the same setpoint. 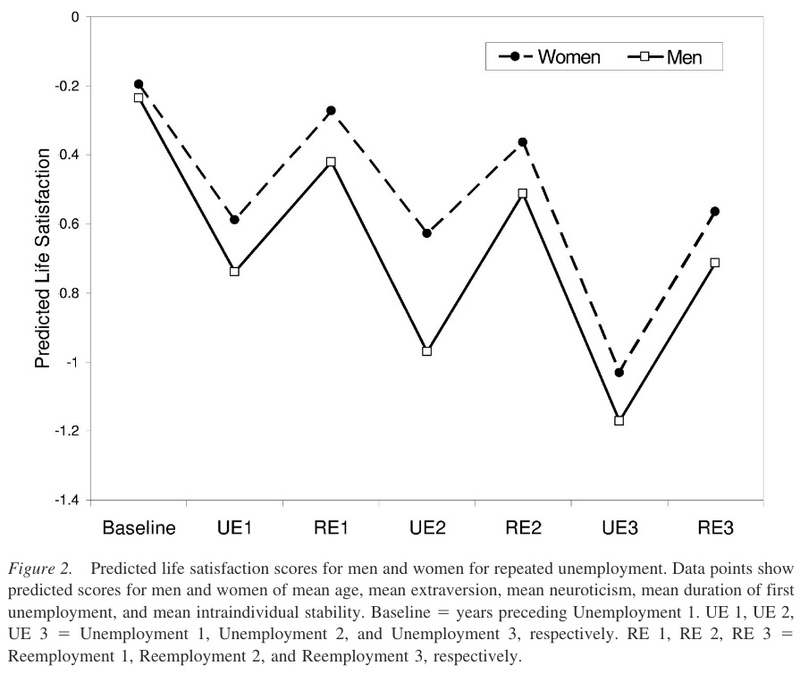 Unemployment permanently moves their life satisfaction setpoint down. Unlike other life events, even some terrible ones, people weren’t recovering from “unemployment what was “long-term” (a few months). Instead, it permanently altered them. This happened for each bout of long-term unemployment. Each time, the set point got lowered down from where it was, then didn’t quite bounce back afterwards. Their life-satisfaction setpoints going lower. At some point, life will lose all flavor and they will be shells. It’s interesting how people who have never gone through unemployment have so many keen judgments about what is going on inside these people. They are quite sure that it is only these workers’ lack of “internal fortitude” or lack of true godliness or whatever. All they know is that they certainly would not react to unemployment like this. Except that they do when it happens. There are some interesting variables. It’s much less pronounced where unemployment is more common, because you just don’t get as down when everyone else is also unemployed: misery loves company in part because it makes it less miserable. Men seem to suffer this more than women. Money does not seem to be the issue. Which is really strange because financial concern is one of the main drivers of unhappiness at the bottom end of society. Down at near the poverty line, money buys happiness. A lot of happiness. But for the unemployed at the middle or top, this was a surprising small variable. Now imagine a whole subset of society that has been seeing this. They aren’t just angry about losing money. They are angry about losing themselves. And because they no longer find life satisfying, and do not feel like it ever will be again, they are more than willing to burn it all down to make “those smug bast**ds” feel the helplessness and horror that they have felt. The more the “elite” talk about how this or that person that these angry men support will destroy everything, the happier they get. And they have guns. A lot of guns. And they’re getting to the point where they don’t see any downside to blowing up society. I came across a study a few months ago, unfortunately I can’t remember it’s source, that claimed that an unemployed person who switches over to retirement increases in happiness. An “underemployed person”, and a “retired person” may seem superficially similar in their work habits, i.e. they aren’t getting paid very much, but there is a vast categorical distance in terms of the expectations of others; if you have retired, then you are no longer expected to do work, you have exited the rat race, and whether you have won or lost, you can in a sense put it behind you. People developing a career are not in the same position. There is an awareness of opportunity cost, of progress made through the levels of a business. Becoming unemployed for any serious length of time represents breaks to that structure, it is not professional development but a step backwards. Again, if someone takes a sabbatical, framing that unemployed time as an alternative project, as something that interests them, or switches career rather than trying to plug away in the same vein, you would not expect the same kind of reduction in satisfaction. My hypothesis is that it is when people’s life project of their career takes a hit that they gain lower satisfaction, because the sense of being “behind” acts as a drag on their self esteem. As a practical comparison, in the RO world, there is that idea of progress up the work levels of a business. That context was defined in terms of age, in a period where jobs for life were more common. But what if there starts to be a mismatch between the progress expected of you within a business, increasing seniority etc. and your actual physical seniority? Is it that people’s business experience lags behind their age, meaning that their progress in terms of work levels within that domain is diminished? Is it that the natural patterns of promotion fail to recognise their progress through different work levels due to personal development that has happened outside of that specific company? Is it possible to actually fall backwards in your levels of perspective and foresight because of being stuck in positions of a lack of influence? The final option, is that both seniority within a company and wisdom in later life are to some extent constructed, and people fail to recognise their own potential for expanded capability because of their situation; that does not offer them the expressive depth to prove their own mental flexibility and foresight in conversation, to themselves or others. In short, unemployment becomes an excuse not to give the people affected by it better conditions or work more appropriate to their skills, while the overall economy continues eventually without impediment. This would suggest that the problem is of lack of recognition of people’s capacity when development of those capacities happens outside of the traditional work environment, and that a solution might be in finding ways to transform long term unemployment into something closer to a sabbatical, something that gives the unemployed person distinctive capacities that allow people to recognise their personal development, even in periods were they were not making money.